"1080p provides the sharpest, most lifelike picture possible." "1080p combines high resolution with a high frame rate, so you see more detail from second to second." This marketing copy is largely accurate. 1080p can be significantly better that 1080i, 720p, 480p or 480i. But, (there’s always a "but") there are qualifications. The most obvious qualification: Is this performance improvement manifest under real world viewing conditions? After all, one can purchase 200mph speed-rated tires for a Toyota Prius®. Expectations of a real performance improvement based on such an investment will likely go unfulfilled, however! In the consumer electronics world we have to ask a similar question. I can buy 1080p gear, but will I see the difference? The answer to this question is a bit more ambiguous. To fully understand the implications of high resolution and high definition we must first explore the limitations of human vision. The Dictionary of Visual Science defines visual acuity as "acuteness or clearness of vision, especially form vision, which is dependent on the sharpness of the retinal focus within the eye, the sensitivity of the nervous elements, and the interpretative faculty of the brain." Simply put, our eyes have a resolution limit. Beyond our ability to see it, increased image resolution is simply an academic exercise. It can have no real part in improving the viewing experience. Unlike hearing, our visual acuity is unambiguous and relatively simple to measure. Vision is measured using a few different tools. The most familiar is called the Snellen chart. Using this tool an optometrist or physician would ask you, from a standardized distance of twenty feet (six meters in countries that use the metric system), to read the "letters" on the chart. The smallest line that can be read accurately defines the acuity of vision, which is expressed in a quasi-fractional manner. 20/20 means that a subject can read the line that defines average vision from the prescribed twenty feet away. 20/10 means that same subject can read, from a distance of twenty feet, the line that a subject with "normal" vision could only read from ten feet. 20/10 vision is therefore twice as good as 20/20. Similarly, 20/40 is half as good with the subject being able to read at twenty feet what someone with normal vision could read at forty. The next part of the puzzle is applying this understanding to a video display or other image composed of heterogeneous elements. The human eye’s resolution (acuity) is directly proportional to the size of the elements of the image and inversely proportional to distance from the elements. This relationship is best expressed in degrees. It's common knowledge that people have a finite field of view, which is normally considered from its upper limit. Technically this is said to be the angular extent of the observable world that is seen at any given moment. Roughly put, we can see things that exist within a known angle with the apex being our nose. Staring straight ahead the average person has a stereoscopic field of view (not including peripheral vision which allows nearly a 180 degree field of view) of about 100 degrees. In a similar manner we have a lower limit to our field of view. Scientists express this as an angle as well, but because that angle is less than a degree we have to use the language of engineering and describe this lower limit in minutes of arc. Everyone knows from their high school geometry classes that a circle is 360 degrees (360°). For angles smaller than 1 degree we use arcminutes and arcseconds as a measurement. An arcminute is equal to one sixtieth (1/60) of one degree. "Normal" visual acuity is considered to be the ability to recognize an optotype (letter on the Snellen chart) when it subtends 5 minutes of arc. We can most certainly see objects below this level, as this describes only our ability to recognize a very specific shape. Taking this a step further, we find that the lower limit of "resolution" of average eyes equates to roughly ½ the limit of acuity. In other words, the average person cannot see more than two spots (pixels if you will) separated by less than 2 arcminutes of angle. A sales and marketing professional, Joe holds degrees in Electrical Engineering and in Applied Business. He has been honored several times within the consumer electronics industry, being selected to serve as a judge for the prestigious Consumer Electronics Association "Mark of Excellence Awards" and having served on the Board of Directors of the Satellite Broadcasting and Communications Association. Anyone want to hop in the way back machine with me to bring back up this article and how it relates to 4k UltraHD? One thing to keep in mind is that they are based on having 20/20 vision. If you have worse vision, you can sit closer, and if you have better vision, you will want to be farther away than what is indicated there. But for someone with 20/20 vision, sitting only 8 feet from the screen, one would need a TV larger than 61 inches in order for it to make any difference whether one had 1080p or anything with higher resolution (like 4k). And if one is 10 feet away, one would need a TV larger than 76 inches for 4k to matter instead of having 1080p (again, assuming 20/20 vision). 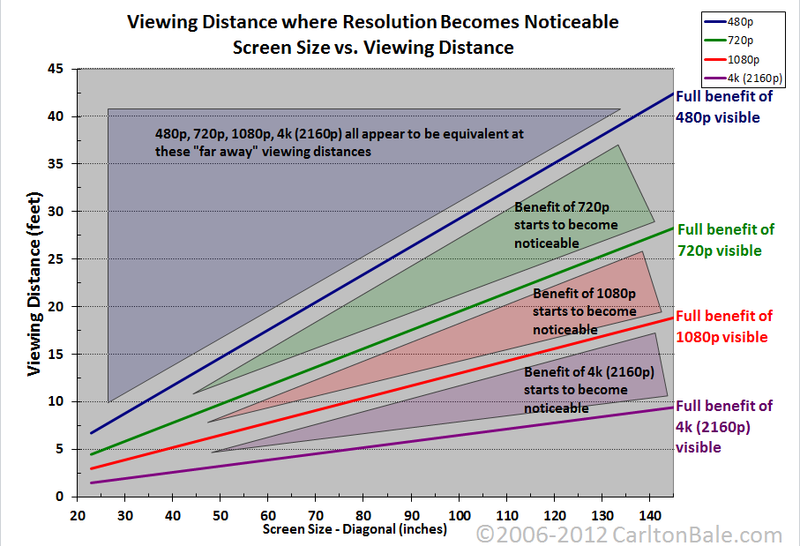 The upshot is, for most people with the size TV and viewing distance that they have, 4k will be completely irrelevant. But many of them will buy it anyway, because when they are 3 feet away from the screen at the store, they will be able to clearly see the difference between 4k and 1080p, but then they will put it so far away from their viewing position that they will have completely wasted their money on the higher resolution. But people have long wasted money in their choices of AV systems, often spending too much on amplification and too little on the speakers, and thus they have inferior sound to what they could have had for the same or less money. But any fool can tell that 4k has more detail than 1080p, and that 120 watts is more than 100 watts. The thing is, often those are not differences that will matter in actual practice, depending on all of the other circumstances involved. And some of the things that matter are hard to quantify (like better speakers), and so people often don't take enough care with those things that make a real difference. I should preface my post with I haven't had a chance to view 1080, my TV runs in 720p mode and for the most part I like it. I also don't run brand new equipment. So this weekend I upgraded my receiver. I went from a Denon 3801 to a 3803; like I said I don't run new stuff and I wanted upconversion. So I notice two differences one of which is clearer audio and video (this really surprised me). I could never make out all of the audio in the comcast Bengals commercial, I can now. The video also appears clearer and a bit brighter. So, with that said, I think the differences will become more apparent in the next few years. HDMI, despite being a spec for a few years is in my opinion still young and only starting to come in to is own. I think it takes the manufactures and circuit designers a few iterations to really get it right. I think the differences I'm experiencing between the 3801 and the 3803 are perfect examples of this. So, I think both sides of this topic are correct. I think with the right hardware people will see a difference. Maybe I'm way off basis, but thats my impression. I'm apparently not allowed to post URLs. Any idea where such a pattern can be found for testing my display?